Cardiff Fire's Sam Bryant. Pic: James Assinder Photography. Cameron Basnett, a 22-year-old defenceman, has jumped out of the Fire into the Fire. 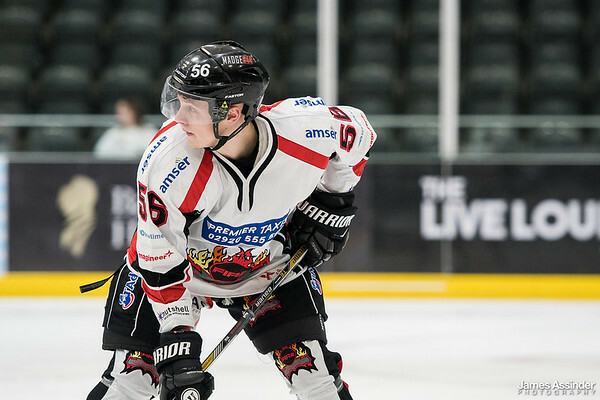 The former Guildford Fire Kings player has switched to Cardiff Fire and made his debut this weekend. Basnett impressed during the convincing 10-2 National Ice Hockey League win against Lee Valley Lions at the Viola Arena. The smooth-skating D-man is a solid addition to Fire’s Division Two South team in their quest to qualify for the play-offs. This was a big weekend for Fire, who held a team meeting after their 12-0 defeat at Slough Jets on Saturday. The result was a far more disciplined performance, cutting down on the number of penalties given against them. Players had sat out more than two and a half hours in penalties during six matches this season. Jordan Powell (15) closes in on the net for Cardiff Fire. Pic: James Assinder Photographer. James Whiting, aged 20, was in goal for Fire following an injury to Lewis Davies sustained at Slough. Davies is expected to be out for three weeks. Fire proved far too strong for a Lee Valley team who had only 10 players dressed, giving them less than two lines. Player-coach Chris Douglas was Cardiff’s back-up goalie and he worked alongside former Devils defenceman Mark Smith on the bench. Lions goalie Steven Grout made a series of big saves, but Fire will be disappointed they were not far more clinical from their chances. An ambulance was called after a collision involving Ross Wilkinson which left him lying on the ice. Wilkinson, though, recovered after being carried off on a stretcher and walked out of the area feeling a lot better. The next Fire home fixture is against Swindon Wildcats on Sunday, November 18. Cardiff Fire’s Elliott Murdoch in a tangle. Pic: James Assinder Photograohy. Scorers, Fire: Lewis Stevens 2+0, Joe Morris 1+0, Stephen Deacon 1+1, Morgan Evans 1+0, Elliott Murdoch 1+0, Tamas Elias 1+1, Sam Bryant 2+1, Jackson Price 1+4, Jordan Powell 0+3, Alan Armour 0+1, Cameron Basnett 0+1, Phil Manny 0+1, Ross Wilkinson 0+2, Viktor Langseth 0+1, Chris Fox 0+1. Lions: Tomas Hnilica 1+1, Michael Jacobs 1+1, Gus Zimmerman 0+2. Period scores (Fire first): 2-0, 6-1 (8-1), 2-1 (10-2). Penalties in minutes: Fire 2+2+8=12, Lions 8+0+12=20.